As promised, here is an analysis of the IVD amendments further to the report provided by rapporteur Liese, with numbers 75-237 and 238-399. Not that as many as the medical devices ones, but still a lot – and no less complex. I won’t repeat all the procedural proposals that are both in the medical devices regulation proposal and the IVD regulation proposal (like UDI); please see the medical devices regulation proposal and my discussion of that proposal in that respect. I have tried to group them into categories as much as possible. I’m not at all sure that this blog gives a comprehensive view of all amendments, it’s intended to provide an overview of the points that I considered especially important with the interest of my clients in mind, which are mainly industry (manufacturers, ranging for SME to multinational). As you will see, an important part of the amendments concerns home brew devices and genetic testing. Home brews obviously feature because this is an important item for industry that has a longstanding and complex love/hate relationship with the subject. Genetic testing, but also self-testing, is being subjected to additional counseling and consent controls that I don’t believe will achieve the policy goals aimed for. It breathes a not too rational fear of the unknown. As mentioned, ENVI will discuss the amendments among themselves on the 29th of May and vote on them on 10 July. Recital 7a and article 2 (1) (3): Accessory rule amended, sensible amendment I think because it seeks to limit the scope of the concept of accessory to only the kind of devices that assist the medical functionality of the medical device. That’s a good way to make sure USB cables, transformers, wifi routers and that type of stuff that are certified for use with a particular medical device do not become accessories. More amendments for the definition of medical device: apart from “prediction” it is proposed that it will also include “prognosis”. Article 2 (1) (1) (4) Definition of ‘self test’ to include “testing services offered to lay persons by means of information society services;”. Article 2 (1) (1) (6) Back and forth on definition of companion diagnostic, but in any event expansion of scope (move from eligible for ‘specific’ therapy instead of initially proposed ‘targeted’ therapy, complete redefinition of definition to include label requirements for device and drug. Article 2 (1) (1) (10): label to include also information on the manufacturer’s website (entirely appropriate under the current circumstance and state of art, I would say)Definition of ‘novel device’ and ‘device for genetic testing’ (article 2 (1) (1) (12a) – novel devices definition need for performance evaluation requirements (“– a device which incorporates technology (the analyte, technology or test platform) not previously used in diagnostics, or; – an existing device which is being used for a new intended purpose for the first time;”); “‘ device for genetic testing’ means an in vitro diagnostic medical device the purpose of which is to identify a genetic characteristic of a person which is inherited or acquired during prenatal development.” – this definition is required for the provisions proposed with respect to genetic testing, which I have partly discussed already. Article 2 (1) (5) (32a) addition of definition of (32a) ‘clinical validity’ means a device’s ability to detect or predict a particular clinical condition or physiological state in relation to its intended purpose (e.g. screening, diagnosis, prognosis). Definitions of diagnostic specificity and diagnostic sensitivity (articles 2 (1) (5) (38) and (39). Definition of sponsor: inclusion of “financing” of a clinical performance study as criterion for being sponsor (article 2 (1) (5) (45). Recital 9a: “devices which are produced within health institution laboratories for use in that environment and are not subject to commercial transactions are not covered by this Regulation”. You can see the problems with this from miles away – with healthcare being as public as it is, is the provision of healthcare services a situation in which the devices are ‘subject to commercial transactions’? And what if parts or technology are sold to a health institution for building such a device? We’re right back in the RUO discussion that has been going on forever under the current IVD directive. Recital 9a: “In the case of urgent or unmet medical needs for patients, such as emerging pathogens and rare diseases, single health institutions should have the possibility to manufacture, modify and use devices in-house and therefore address, within a non-commercial and flexible framework, specific needs which can not be met by an available CE-marked device.”; this seeks to enable an emergency and/or unmet medical need exemption for IVDs. Recital (9b) “However, devices which are manufactured within non-health-institution laboratories and put into service without being placed onto the market are subject to this Regulation.” and article 2 (1) (3) (21) definition of health institution to change to organizations “within a Member State’s public healthcare system whose primary purpose is the care or treatment of patients or the promotion of public health; commercial laboratories which provide [commercial] [diagnostic / clinical] services are not health institutions” This proposal seems to assume that healthcare institutions will always do better for in-house produced devices or that commercial labs should not engage in unfair competition by building their own home brews. I would have expected a justification for treating these situations differently, because distortion of competition for example happens also with healthcare institution home brews, whereas there is no evidence that they are better at quality and safety than commercial labs (as far as I know anyway). Secondly the definition of health institutions is not future proof in view of the increasing privatization of healthcare in the EU. If you make commercial as opposed to public the deciding criterion, this definition will depend on how each individual member state organizes their healthcare system and what part they put in the public system and what part in the private. Diagnostic services are often outsourced. Article 4 (5) (1) Member states must require submission of a list of laboratory developed devices and must impose further safety requirements. The initial proposal already did not specify what those further safety requirements could be. Article 4 (5) (2) – back and forth between amendments regarding the classes of lab developed devices subject to exemption and the scope of the exemption regarding class D devices. Article 4 (5a) – possibility for member states to restrict in-house manufacture altogether and make it subject to additional requirements. Recital (32) summary of safety and performance – back and forth between amendments on what classes are considered high risk (C and D, says one), where the report should go (authorities and/or Eudamed) and whom should have access to it in Eudamed. Recitals (35), (35a) and (38) – creation of a ‘swift’ market authorization procedure for “high-risk in vitro diagnostic medical devices of class D”. I have been saying it and will say it again: using the word swift does not make something fast except in fairytales where magic spells actually work. The marketing authorization procedure copies the terms of those of medicinal products and not even the authorities themselves call those ‘swift’, as I have argued again and again and demonstrated by reference to the EMA’s Roadmap to 2015. Also medical devices authorities are now openly saying (based on actual research, mind you) that while some degree of additional control over what notified bodies do (which the Commission put in its initial proposal), the real safety and risk reduction benefits are to be reaped in the (and don’t say I haven’t been telling you this for some time) post-market phase by (drumroll please) obliging doctors to report incidents and active monitoring after market access. Active monitoring after market access is precisely what even the pharma regulators propose with the adaptive licensing model and what the Commission proposed to implement with the post market clinical follow up plans. The PMA controls that are being proposed are so contrary to what is considered state of art regulation that I am deeply disappointed in this process of fact free politics that ENVI is running. As Victor Hugo said: “On résiste à l’invasion des armées; on ne résiste pas à l’invasion des idées.” (often wrongly paraphrased as: “One cannot resist an idea whose time has come.”), but let’s not allow fact free politics to rule this discussion and rather go with the evidence based approach of regulators that also ENVI thinks know what they’re doing and colour between the lines of the regulatory state of art rather than take the populist DeLorean back to the future and all be worse off. A good friend of mine said in relation to the General Data Protection Regulation proposal that “ignorance x fear = inertia”, which is completely spot on in this legislative project too. Yes, the system needs to improve and no, 1965 medicinal product directive methods are not the way to go – everybody agrees with that except some parliamentarians, which are the only ones in this discussion not using facts to back up their position. Sounds bananas, right? It is. article 39 (1) – “novelty, complexity” are also classification criteria for division in risk classes. This shows how fundamentally flawed and populist the ENVI committee’s thinking is in these matters: they seem to reason “innovative = scary = risky” as well as “complex = too complicated for me to understand = risky”, which is scientifically utterly unfounded and will damage EU credibility and innovation. That is the kind of thinking that used to get scientists in trouble with the church centuries ago. But really, we should be beyond this in the 21th century. Article 39a-f sets out a procedure for a central marketing authorisation for innovative class D devices and a decentralized marketing authorization for non-innovative class D devices administered by EMA (article 39c). I think I have said enough about how unworkable a criterion of “innovative” would be, especially if left to the Commission to define by means of delegated act. This a very bad and unworkable idea that will impact innovation very badly. It also makes things unnecessarily complex with the definition of ‘novel device’ proposed in article 2 (1) (12a) that has no bearing on the deciding criterion for the marketing authorization procedure. Recital (44a) and article 48a “An interventional clinical performance studies or any other clinical performance study should only start after being granted a positive evaluation by an independent ethics committee.” – the IVD regulation proposal already contained an instrument for the evaluation of clinical performance studies, but the Parliament is differing in opinion with the Commission whether or not Ethics Committees should do that evaluation. The Parliament says yes, also in the Clinical Trials Directive revision. Recital (49): Reporting of suspected serious incidents anonymously, and raising awareness of the importance of reporting suspected serious incidents. The justification provided is that “The Vigilance procedures in Chapter VII will only function correctly if healthcare professionals feel able to report incidents without fear of retribution. In some circumstances, anonymous whistle-blower protection may be needed in order to ensure full and frank incident reporting.” – I don’t understand this. HCPs should be obliged, morally and legally, to report suspected incidents for vigilance to function correctly and not encouraged. If their work environment is such that they would need whistleblower protection, the authorities should root out the problems and fix them. It’s like with anti-corruption: rules only work if they apply to both sides of the equation, so both to HCPs and manufacturers. Report of suspected serious incidents must take into “whether parts or components have been replaced”, which is interesting in light of the rules for components that change performance and risk of the device. Article 1 (6) direct to consumer advertising limitations of of prescription only devices (class D and C (C for companion diagnostics and genetic testing devices)), with possibility for Commission to include more by delegated act. New article 5 (2b) proposes contains general ban on a number of misleading or deceptive B2C and B2B statements that are already covered by general misleading advertising or unfair B2C marketing rules and just complicate matters. Article 4a – new requirements for genetic testing: use of devices for genetic testing only with informed consent, administered by admitted persons , weird additional requirement that “the clinical data generated in the course of the testing are expected to be reliable and robust” (that is something you would check during conformity assessment of the device, right? ), mandatory counseling which “shall include medical, ethical, social, psychological and legal aspects” and its form and extent depend on “significance for the person or the members of that person’s family” (so will I be able to sue my doctor if he does not correctly inform me about skyrocketing life insurance premium consequences of a test result? With this wording I would certainly try.). The amendments made are intended to make “clear that genetic counselling is not mandatory when it just confirms a specific diagnosis and it is also not necessary for companion diagnostics or when the genetic test shows a normal finding. I find the predisposition of the ENVI committee to meddle with genetic testing worrying given the enormous potential of health advances with personalised medicine as described by Eric Topol. It may sound disruptive what he says but it truly makes sense, just like washing your hands as a doctor (which was also a very disruptive theory at the time). If you want to protect people, transparency is the best option and rather than keeping them ignorant they should be better protected against social security and insurance consequences that they cannot understand in advance. Article 8 (2) and Annex 2 – point 7 (new) – proposal to make the whole technical documentation (tech file) public – fits in the current move towards transparency but overshoots it completely (all other proposals were limited to the clinical parts of market access dossiers) because the whole tech file will be crammed with confidential information that manufacturers will never want to disclose. This would truly be a violation of article 39 TRIPS if you do not already consider disclosure of the clinical part that. Article 8 (9): a right of information for product liability cases to balance the information disparity with the manufacturer. Article 7 (1) – proposal to limit CTS to only class D and companion diagnostics. In the vein of the genetic counseling proposals “Member States should ensure appropriate counselling conducted by persons admitted to the medical profession under the applicable national legislation before the use of such self-testing devices that are manufactured to test for chronic and transmittable diseases.” (Annex 1 – part II – point 16 a (new)). Annex 7 – part 2 – point 2.6 – paragraph 1: “novel class B devices will be classified as class C.” – refer to proposed definition of novel device in 1 (2) (12a). 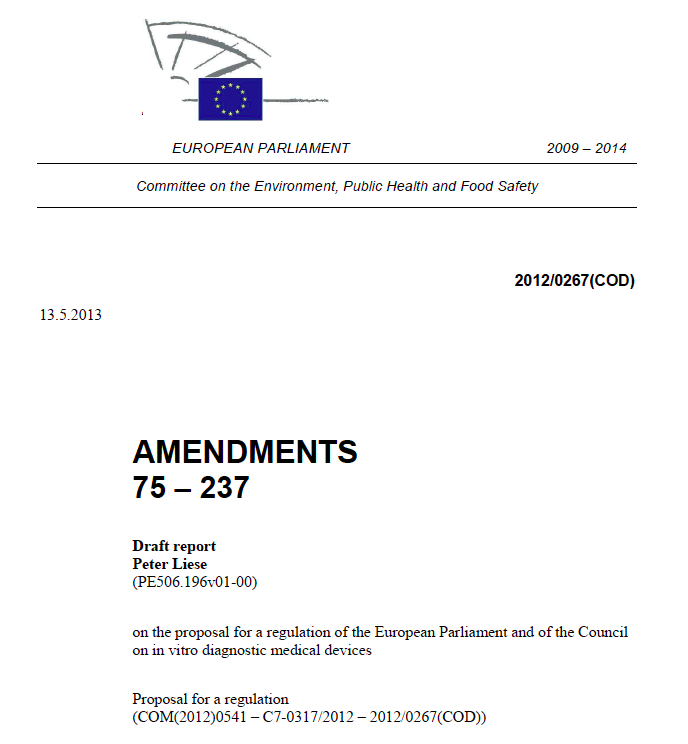 ENVI discusses these amendments and the medical devices ones tomorrow and votes on them on 10 July. Do you see anything that doesn’t make sense or is just plain bananas like the PMA system proposed? You can still influence the discussion. Contact a parliamentarian from the ENVI committee and tell them what you think, preferably contact the ones that have put their name to amendments (which you can see in the amendments that I linked to). Together we have a lot to lose as a result of ineffective legislation. I would truly hope that there are more people with an opinion in these matters. And Mrs Roth-Behrendt and others in ENVI – in case you think I am in the pocket of the industry please think again: several members of my family depend on medical technology for their LIFE. This dossier is not a game for them. I want the best technology available to them as quickly as possible, not the least innovative and that too much delayed. I want it for myself too when the time comes, because we’ll be working with this legislation for decades to come. That is more important to me than anything else in the world. With these proposals you will not deliver on your promises, regardless of what you say in hearings. It’s time to ditch the fact free politics.